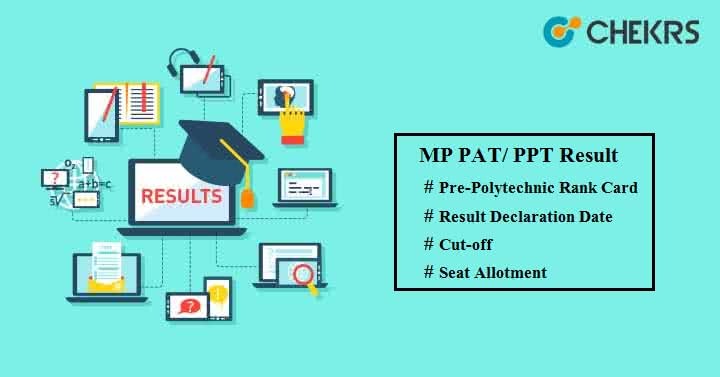 MP PAT/ PPT Result 2019 : All candidates who have successfully given the Pre-Polytechnic Test (PPT) or Pre-Agriculture Test (PAT) examination, they will soon able to see their Score Card. It will be available via Online mode only. MP Professional Examination Board (PEB) or MP Vyapam will be responsible for publishing the results on its official website. Get here all detailed information related to MP PAT 2019 Result or PPT results. PPT or PAT examinations were held on different dates, so the results of both exams will also be announced on different dates. Here we have presented the expected Result Date along with other important events. Move to Results option available at top of the portal. Select your exam name PPT or PAT and click on it. Enter your Roll No. & Date of Birth and then click on ‘Search’ button. Your MP PPT or PAT result will appear on your screen. You can download the result and take a print of it for future use. Candidates need to score the minimum marks to achieve the qualified rank in the exam, those minimum required marks will be considered as Cutoff. MP PAT Cutoff will be based on category wise & college wise. MPPEB will prepare a separate merit list for all reserved categories. A common Merit List will be published which will include name or rank of qualified students, belonging to all categories. Counselling will be conducted for those students who will secure the rank in the exam by satisfying the cutoff criteria. Qualified candidates will have to appear in the counselling round to complete the admission process. MP PPT Counselling schedule will be available on the official website. MP PAT Counselling will probably start by the end of May month. Students will be given seats on the basis of their rank, college choice & seat availability. If the seat remains vacant then other students will get the chance to appear in the seat allotment process. For any kind of assistance regarding MP PAT Result or PPT Results, put down your message in the message box below.